What makes a relationship real? Is it blood? Dedication? Love? As the little girls in this book know, real sisters never have to pretend. In Real Sisters Pretend, two sisters play a game of pretend princesses. The younger sister Mia says to her big sister Tayja “Let’s pretend we are sisters” and Tayja quickly corrects & reassures her that they are already sisters, real sisters, and there’s no need to pretend that! As they play, they discuss adoption and a confused stranger they met at the grocery store. I like the way Megan Dowd Lambert and Nicole Tadgell craft the story and illustrations to create a conversation. Like real life, serious & important moments are blended into the silly ones. Tayja and Mia (climbing princesses) play, take a snack break and continue to play until their other mommy comes home. Readers will enjoy Tadgell’s beautiful watercolor illustrations; she brings these girls, their sweet relationship and loving family to life. When I first saw the cover of this book months ago, I was drawn to the image of two brown girls embracing; it’s powerful! It’s the month of Ramadan, a time for Muslims around the world to pray, reflect, and fast with loved ones. Last night at a gay club in Orlando, Florida, at least fifty people were killed and the shooter seems to be Muslim. In this time of sadness, this tragedy has already resulted in increased Islamophobia and racism towards Muslims in our country. We MUST love and understand each other. Hatred has no place here. It’s Ramadan, Curious George is an important and sweet addition to the Curious George book series. We need more books that are mirrors for Muslim children and this is one more to add to your shelf. There’s already a Happy Hanukkah, Curious George, many Christmas books, and now we have one to celebrate Ramadan! I hope this cute book makes it into the hands of Muslim children who need it and any child who wants to learn more about Ramadan and Islam. It’s Ramadan, Curious George is a tabbed board book; its sturdy size and format is perfect for little hands to grasp. Each tab highlights a chapter of the story with a small illustration. The story follows Curious George, The Man with the Yellow Hat and their new friend, Kareem. Kareem is going to try fasting for Ramadan for the first time and Curious George is actually helpful! 😉 He cooks delicious food with Kareem’s family and helps Kareem make it through his tough first day of fasting. The book also discusses the importance of sharing with others; Curious George helps with a food drive at the mosque and even inspires a new tradition! At the end of Ramadan, they happily celebrate Eid together and Curious George is glad to have experienced it all. Hena Khan (Golden Domes and Silver Lanterns) did another great job with this one. 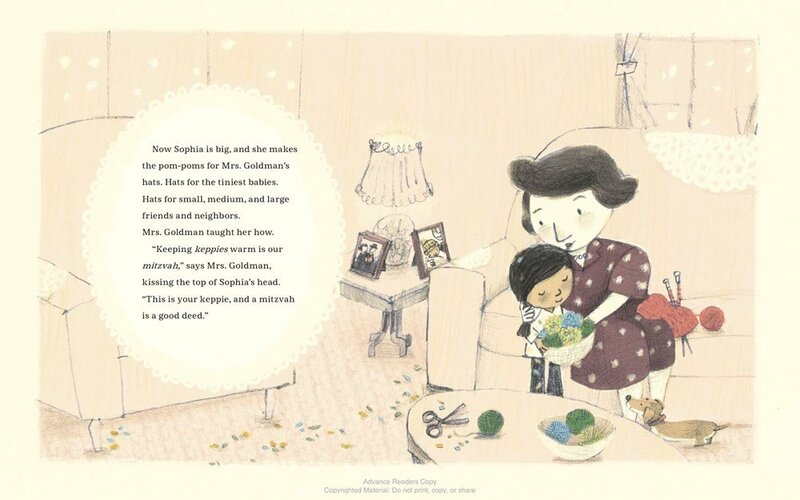 Her informative rhyming text with Mary O’Keefe Young’s sweet illustrations is perfect. You’ll want to keep this book on your shelf not only for Ramadan, but all year long. Books like this are not only important for children who need them but are also important for fostering respect and understanding of different cultures at an early age. I hope you’ll enjoy it with your family!